This weekend I took a 55-mile bicycle ride through rolling country hills about an hour’s drive out of the city. I’m training for an Ironman triathlon so each weekend I take in a lot of scenery as I get my road workouts in. Within the first ten miles of my ride, a large farmhouse caught my eye. It looked a lot like my great grandpa’s farm I used to visit as a kid. The farm house was for sale, so I made a mental note to check and see what country real estate was going for this far outside of the city. A few miles down the road, there was another large house with a for sale sign in the front yard. This house sat high on a hill and backed up to a lake. The lake is a staple of this community, attracting water sports enthusiasts, fishing boats, and plenty of weekend relaxers. No time to stop and check out the price… I still had another 35 miles to ride. Driving with my 14-year old daughter Saturday afternoon, I told her about the lake house I saw for sale. When your 14-year old daughter suddenly engages in conversation, you pay attention. And when she talks about wanting to spend time with her family, that’s even better! Morgan’s excitement made me realize that buying a lake house was not just a potentially lucrative investment, it could also be an investment in our family. One that would yield time, memories, and deeper family relationships. And so, this weekend I’ve been thinking a lot about real estate investments, what an excellent real estate investment would look like, and whether now is a good time to buy real estate or not. Real estate (such as farmland or lake-front property) can help you build wealth just by virtue of the property value moving higher over time. But of course, you have to be very careful to buy property that will be more desirable over time so that the value of your land appreciates. One challenge with this type of investment is that landowners must invariably pay taxes on the property they own. And over time, this can really eat into your profits. At the same time, if you buy a farm or a lake house, the buildings on your property will need regular maintenance. That costs money. And the more you pay to maintain your property, the lower your total investment return will be over time. That’s why so many real estate investors look for properties that can generate cash. Lake houses can be rented out a few weekends a year to help cover expenditures. Farm houses can also be rented out, or you could lease the land to a local farmer who could use the land for his own crops (allowing you to enjoy the farm as a relaxing hobby and not as an agriculture job). My in-laws own a beach condo at Sea Island, and pay a management company to rent it out. The rental income helps to pay for the mortgage and expenses on the property. And since the management company handles all of the cleaning, advertising, and check-in / check-out procedures, there are very few headaches for my in-laws to worry about. Of course, the downside to renting a property like this is that it ties up your getaway spot for some of the time you might have been enjoying the place yourself. This is an obvious drawback, but if you’re not going to be using your vacation spot every weekend, it probably makes sense to offset your expenses with a little rental income. Fortunately, there are services out there like Airbnb that make renting your place out a lot less cumbersome. As I was biking through the countryside, I started thinking about the different advantages and drawbacks of specific locations. If you’re buying real estate as an investment, it’s important to think about how the location of your property will affect its value. Are there attractions close by (such as a lake, a few restaurants, a national park) that would help attract renters? Even if you’re not planning on renting out your property, the value of your investment will appreciate more quickly if it is a desirable location that other investors would want. Is the infrastructure adequate? If I was going to have a lake house for our family, I would need to have high speed internet so I could get my investment research done. I would want to have reliable utilities. These are some of the details you’ll need to consider before buying an investment home. Finally, think a bit about the accessibility of your real estate investment. There’s something romantic about being so far outside of the city that you’re “off the grid” and in your own little world. But does this make for a good investment? Will you really use this place as much for your own enjoyment if it’s difficult to get to? Will other investors buy your property at a premium price down the road? In the past, I’ve thought about buying investment real estate. But I always convinced myself to wait for another economic downturn so that I could buy property at a discount. But I’m beginning to re-think that logic. Obviously, it is important to get a good price on any investment purchase. And you should be patient with any real estate purchase to make sure that you’re buying at an attractive price. For one thing, interest rates are very low right now. Which means you can purchase an investment property with a very attractive mortgage, allowing you to keep more of your family’s wealth allocated to traditional income-generating market investments. So low interest rates make it possible to buy real estate with less capital down, and less cash paid from your account each month. A second reason why now may be a great time for real estate is because of the growing economy. After all, the U.S. is adding more jobs every month, consumer confidence is high, and corporate profits are growing. So while the stock market may ebb and flow, the growing economy creates more demand for real estate which should help the value of our property to appreciate. One final reason for investing in real estate right away is inflation. For quite a few years now, inflation has been modest. But with the U.S. debt level growing and with interest rates at such low level, inflation is a very real threat. One of the best ways to protect your wealth against inflation is to own “hard assets.” In other words, own tangible things that will increase in value as inflation picks up. 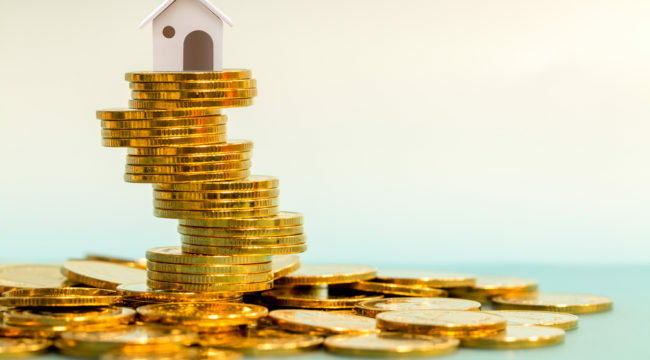 We’ve already talked about gold and silver being excellent ways to protect your wealth, and real estate is another “tangible asset” that will do very well during inflationary periods. I’m going to be doing more research on real estate, investment properties, and vacation home opportunities. I’ve already made calls to a few investors that I know who are very knowledgeable in the area. As I meet with them and learn more about the opportunities and risks in this area, I’ll be passing the information along to you. And of course if you have experience investing in real estate, buying rental property, or just managing a vacation home, I’d love to hear from you. I’m sure you have insights to share that would be very valuable to The Daily Edge readers. Please send your thoughts to EdgeFeedback@AgoraFinancial.com.